"Your situation is always ambiguous, isn't it, Guido? 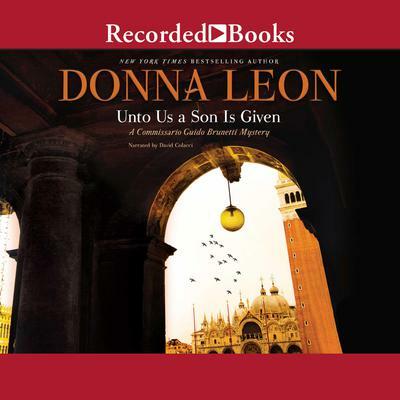 ", his father-in-law, Count Orazio Falier, observes of Donna Leon's soulful detective, Guido Brunetti, at the beginning of her superb 28th Brunetti novel, Unto Us A Son Is Given. "The world we live in makes that necessary," Brunetti presciently replies. Count Falier was urging his Venetian son-in-law to investigate, and preferably intervene in, the seemingly innocent plan of the Count's best friend, the elderly Gonzalo Rodriguez de Tejada, to adopt a much younger man as his son. Under arcane Italian inheritance laws this man would then be heir to Gonzalo's entire fortune, a prospect Gonzalo's friends find appalling. For his part, Brunetti wonders why the old man, a close family friend, can't be allowed his pleasure in peace. And yet, what seems innocent on the Venetian surface can cause tsunamis beneath. Gonzalo unexpectedly, and literally, drops dead on the street, and his good friend Berta Dodson, just arrived in Venice for the memorial service, is strangled in her hotel room?having earlier sent Gonzalo an email saying "We are the only ones who know you cannot do this," referring to the adoption. Now with an urgent case to solve, Brunetti reluctantly untangles the long-hidden mystery in Gonzalo's life that ultimately led to murder?a resolution that brings him way more pain than satisfaction. Once again, Donna Leon brilliantly plumbs the twists and turns of the human condition, reuniting us with some of crime fiction's most memorable and enduring characters.